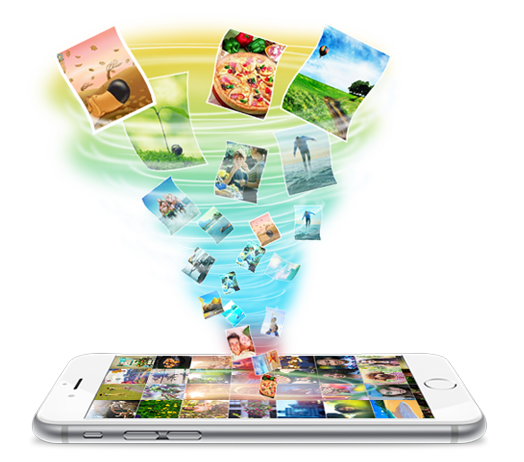 AnyTrans is the higher-class version of PhotoTrans that brings dozens of essential and premier content management solutions, which are specially redesigned for the latest iOS 9 & iPhone 6s. 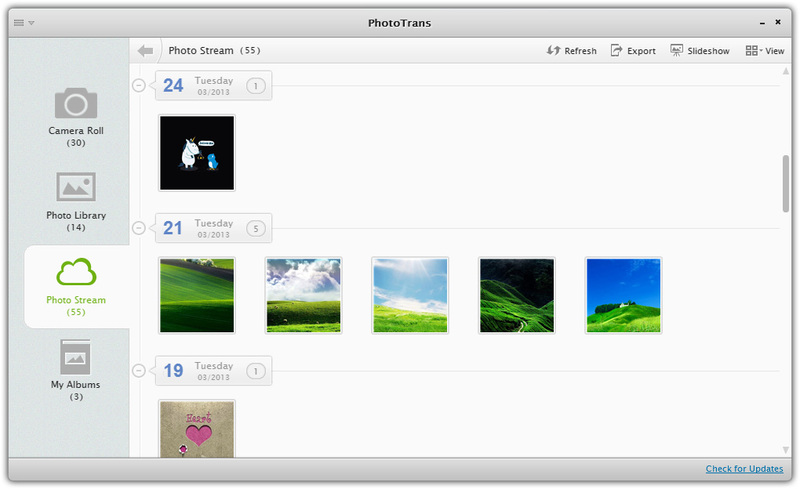 Designed in line with your natural habit, PhotoTrans has an array of features that help you transfer iPhone iPad iPod touch photos to & from computer, organize albums without iTunes and enjoy the wonderful pictures in a slideshow. 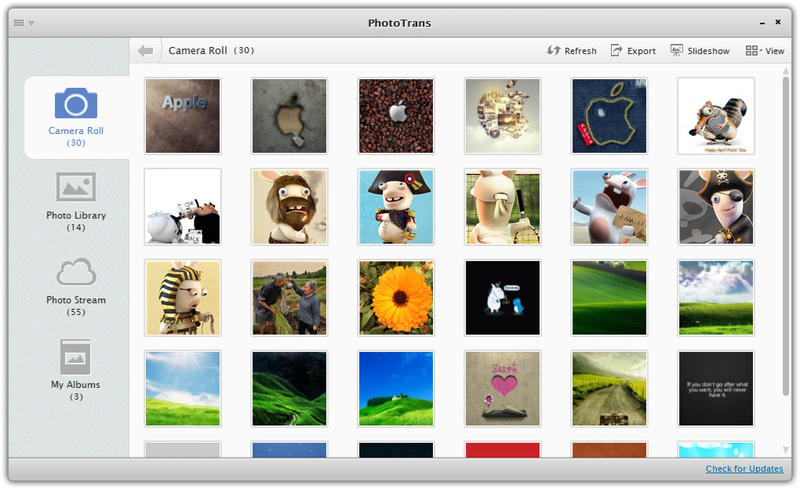 Via accessing the Camera Roll, Photo Stream, Photo Library and every single album, PhotoTrans lets you organize your photos on iPhone, iPad and computer as easy as ABC. Moving thousands of precious photos from a messed library worries everyone. PhotoTrans comes to rescue by featuring an innovative and unique batch photo transfer. Imagine that, through the high-efficient batch mode, you'll be able to transfer thousands of photos or even your entire library between iPhone, iPad and computer, all at once. Taking every piece of your photography works into account, PhotoTrans cares every single picture and even the whole photo library on your iOS devices, including the captured snapshots in camera roll, the photo stream bound to iCloud and other pictures imported from iTunes library. An iPhone is not a storage device. After allotting quite a few gigabites to store music, movies, apps and other contents, probably it'll only leave you a very small portion of space to take pictures. Stop deleting your pictures gingerly. 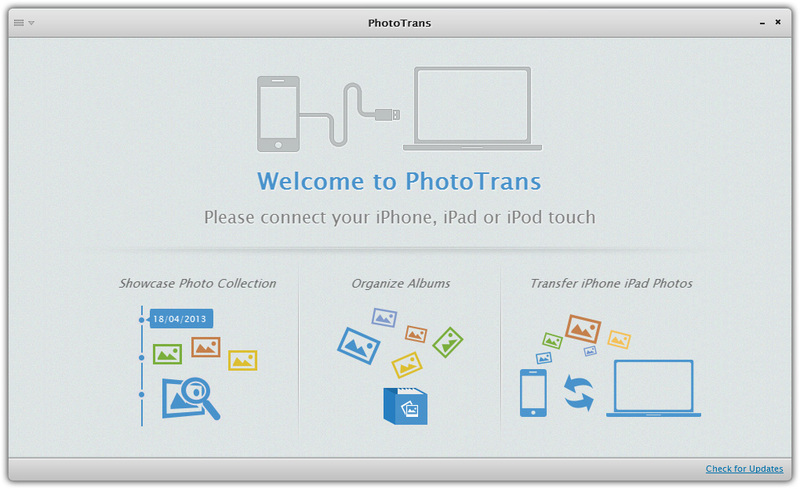 Now you can use PhotoTrans to transfer the photos from iPhone back to computer and relax yourself to remove them on the device in order to get more free space. Need to set up a new photo library? This superb iPhone photo trasnfer excels at salvaging and recovering your photos from device back to a solid hard drive. Beyond that, you can greatly improve the iOS backup time by migrating iPhone iPad Camera Roll to the computer. Sync iPhone photos from selected folders with iTunes is a rediculous idea because every time you want to import photos from an iPhone, you have to perform an endless full sync. 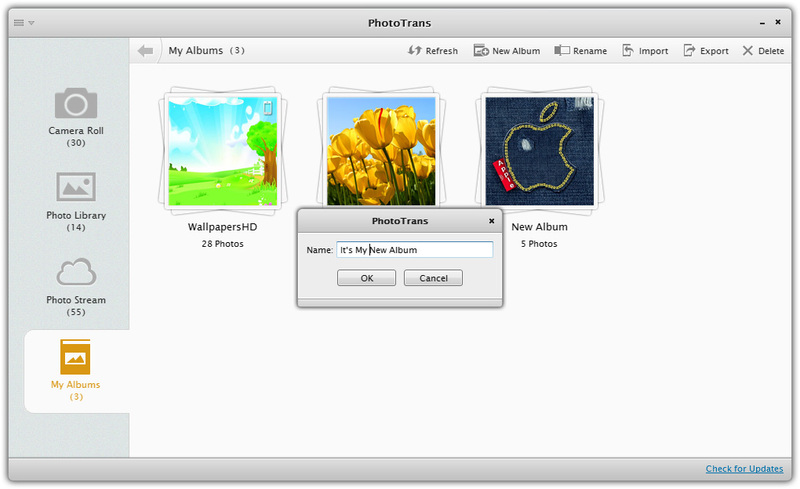 But with PhotoTrans, you are now empowered to freely import the particular photos from any iTunes libraries on different computers. 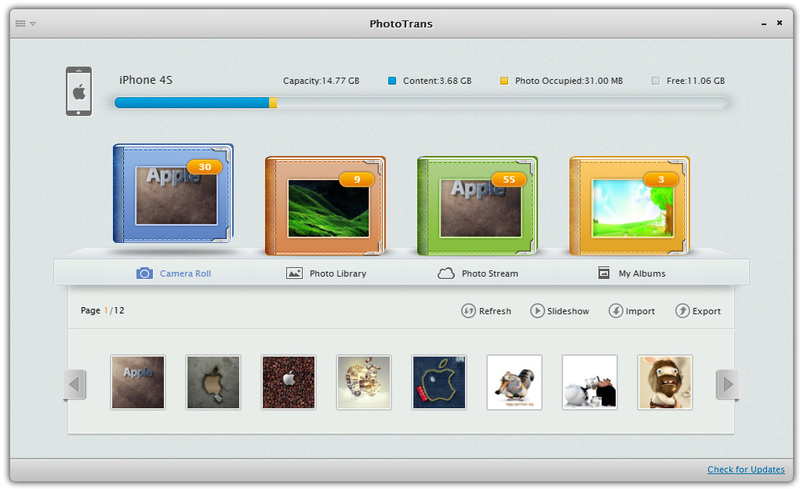 Best of all, it won't erase the original photos and albums stored on your device. Wherever you found a lovely picture, you can grab it with PhotoTrans and then watch it on the move or display it with iPad digital picture frame. Stop here if you still look for a iPhone photo manager software. 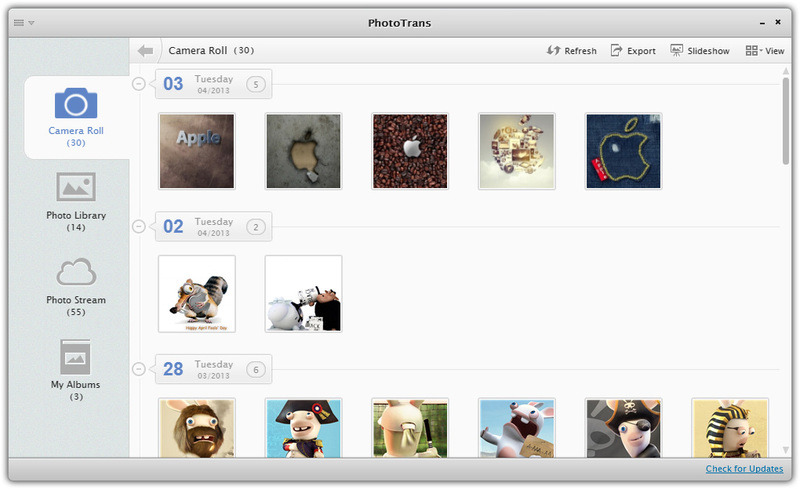 PhotoTrans features the abilities of creating, organizing, deleting and renaming Albums, which are hardly to get edited on an iOS device. 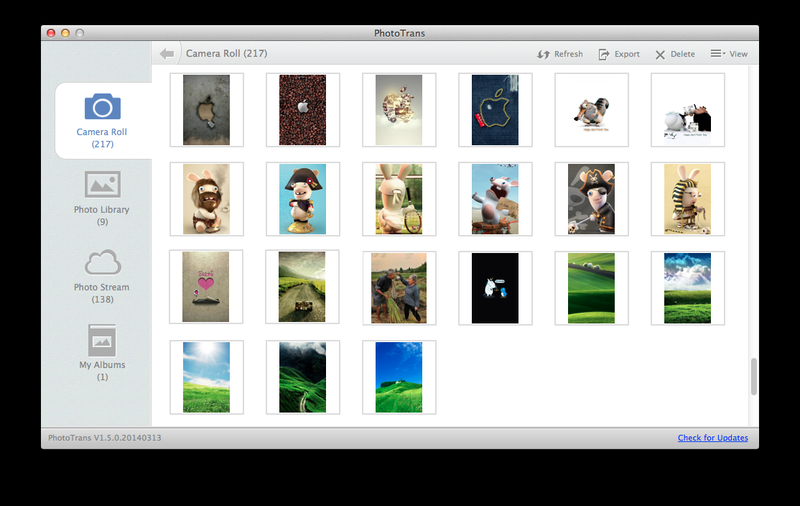 In addition to this, you can also add, sort and remove the photos within an Album. 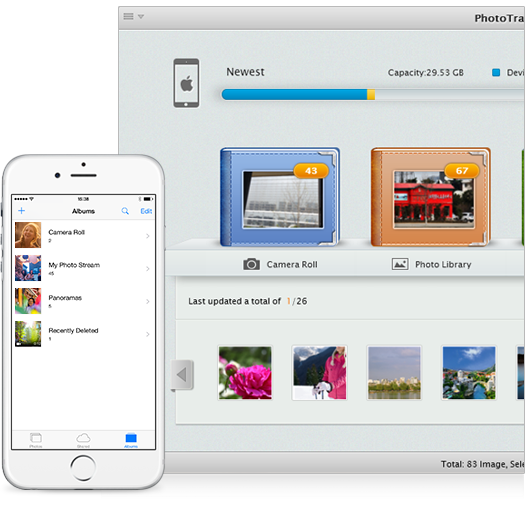 Without such a powerful and versatile utility, you'll feel utterly lost when trying to move particular photos from iPhone, iPad and iPod touch Photo Library, Camera Roll and even Photo Stream to a chosen album. Transfer All Photos at Once The only one iPhone Photo Transfer that can import and export your whole library between iPhone, iPad, iPod touch and computer all at once. Export Photos to Computer Move photos from device to computer in order to save more free space, backup & recover the photo library, and share photos on any computer. 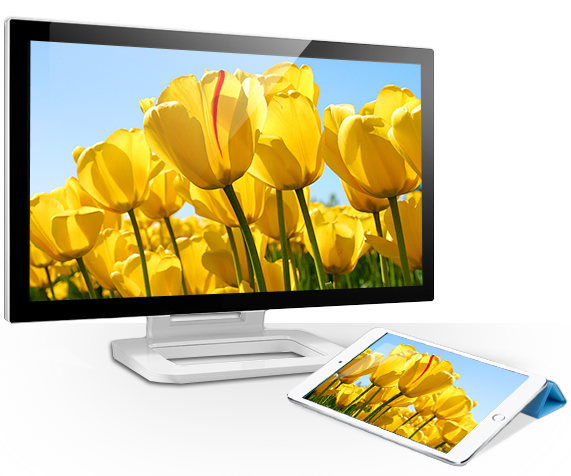 Import Photos to Device Transfer photos to idevices for viewing on the move or using iPad as digital frame. 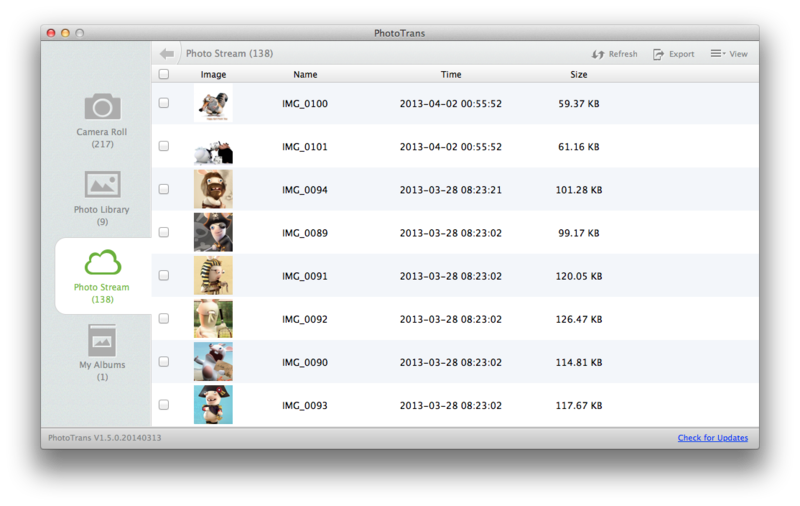 Add photos from any PC, No iTunes sync or erasing pictures. Showcase Photos on PC Support auto-play and manual photo slideshow that allows you to slide photos one at a time, watch them on a computer with the full size. 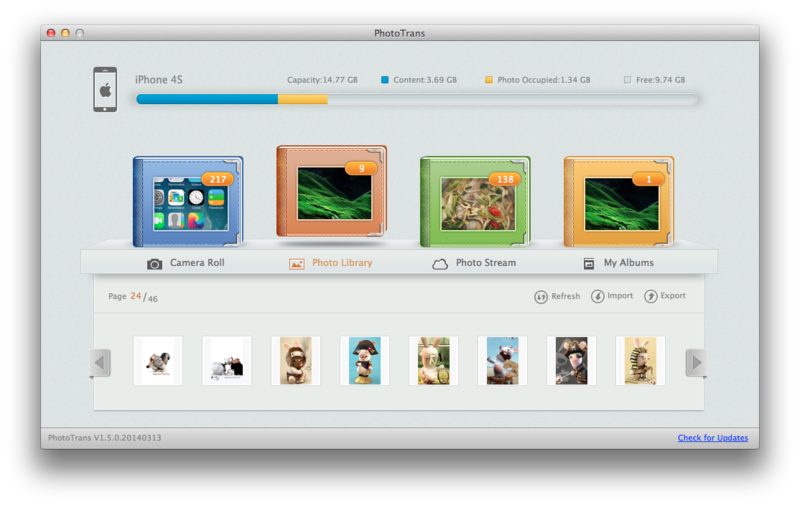 Manage Photos & Albums Creating, renaming and deleting photo album in order to organize your out-of-control photo library. 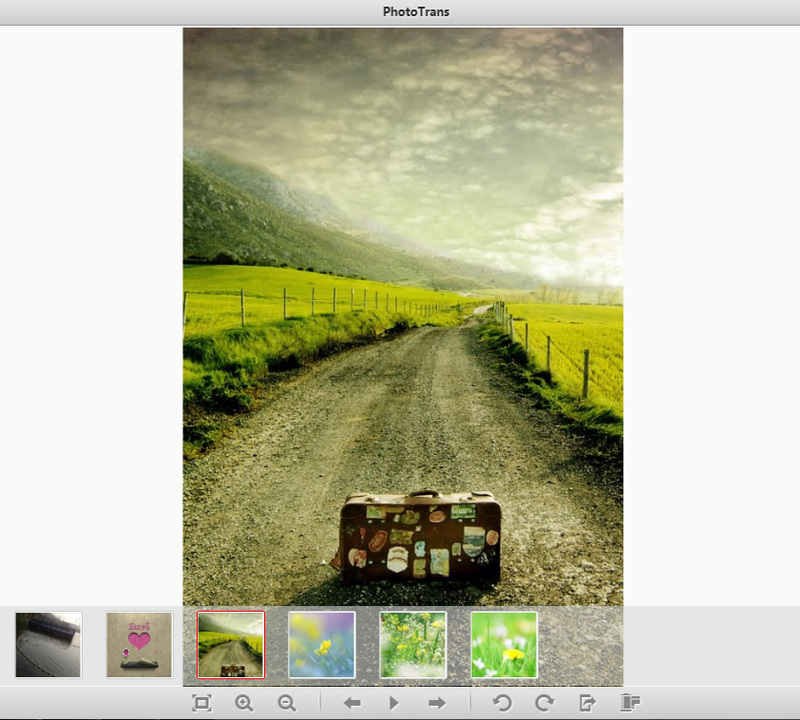 Make iPhone iPad photo management like a breeze. Blazingly Fast Speed Fully supports USB 3.0, Lightning and other up-to-the-minute technologies that ensure to achieve the fastest iPhone photo transferring speed. PhotoTrans is a beautiful software and i really like it. I hate transfer photos to my iPhone 5 with iTunes because it always makes me confused about the photo folders.